Enlarge / A general view of Laguna Colorada located near the border with Chile, in the Uyuni salt flats, Bolivia. The Uyuni salt flats are estimated to contain 100 million tons of lithium, making it one of the largest global reserves of this mineral, according to state officials at the Bolivian Mining Corporation. Two of the world’s biggest lithium producers, Albemarle Corporation and Sociedad Quimica y Minera de Chile (otherwise known as SQM), are tangled in two disputes: the first over water rights in Chile’s Atacama desert, and the second over ownership of SQM. 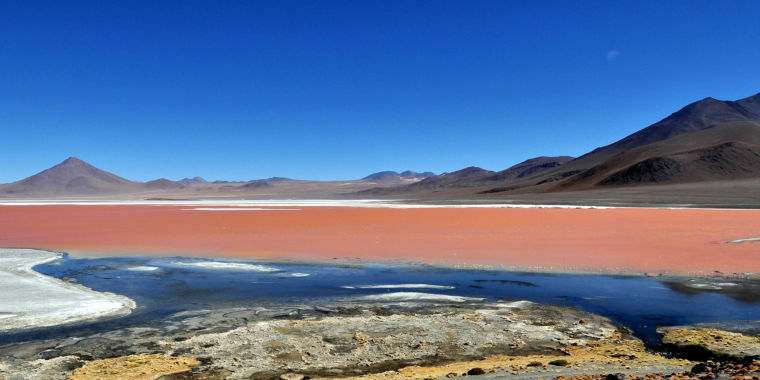 Both Albemarle and and SQM have significant operations in the Atacama desert, where some of the world’s best lithium resources exist. As electric vehicles with lithium-ion batteries become more popular, lithium resources are becoming more valuable. That has created some conflict in an industry that has long remained relatively quiet. This week, Reuters reported that both Albemarle and SQM have accused each other of overdrawing brine from the Atacama’s underground aquifers. Both companies have operations in the Atacama’s Salar, and their operations are just three miles apart from each other. The brine water that has been accumulating for millennia under the Atacama is lithium-rich, and companies pump it out and send the brine to evaporation ponds where heat extracts the water and leaves the reactive alkali metal behind. Both companies have said publicly that they expect to have enough brine to be able to produce lithium for decades, but Reuters found filings with the Chilean government that express doubt about the longevity of the resource that Albemarle and SQM share. In several filings, Albemarle requested that the Chilean government follow up on a 2016 study that found that SQM had overdrawn from the brine reserve between 2013 and 2015. Chile’s environmental regulator says that due to changes that SQM has made over the last several years to how it extracts brine, it’s hard to tell how much brine it has actually pumped. SQM, for its part, also accuses Albemarle of overdrawing its share of brine in 2008 and between 2010 and 2012. Reuters reports that neither the Chilean government nor the companies themselves seem to have a clear understanding of how much brine exists for extraction. The accusations seem to stem from a routine government inspection in 2013, when regulators found that the native Algarrobo trees on SQM’s property were dying. That suggested that the trees, which send roots into the Salar’s aquifers to survive, weren’t getting enough water. “Two years later, more trees were dying but SQM failed to notify authorities, according to government inspection reports,” Reuters noted. In March, a Chilean government report found that more brine was being extracted from the Salar than was coming back in through rainfall and snowmelt. However, the office couldn’t tell whether it was SQM or Albemarle that was withdrawing more water. To deal with this, Chile’s water regulator is expected to place restrictions on new water rights in the Salar. The rivalry doesn’t stop at water between Albemarle and SQM; it appears that the ownership of the companies is also a source of dispute. The Wall Street Journal writes that Canadian mining company Nutrien owns a 24 percent stake in SQM, which it would like to sell to Chinese firm Tianqi Lithium Corp. for $4.1 billion. But Tianqi partners with Albemarle to operate a large lithium mine in Australia. This has left SQM shareholders worried that Tianqi might share industry secrets with Albemarle. Chile’s competition regulator has approved the deal, as long as Tianqi nominates directors to SQM’s Board that are not direct employees, and as long as Tianqi-nominated directors don’t share any commercially sensitive information. But SQM’s largest shareholder, Julio Ponce Lerou (who, the WSJ writes, is also “the son-in-law of the late Chilean dictator Augusto Pinochet”), challenged Chile’s approval of the Nutrien-Tianqi deal in court. A court hearing is set for October 22, and the results will determine whether the Nutrien-Tianqi deal will close in 2018 or will remain in perpetual limbo.